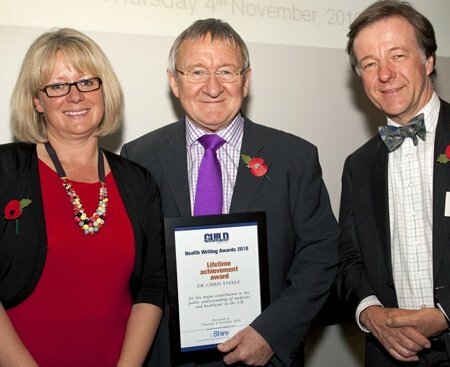 Long-term friend of the MHF Dr Chris Steele has won the lifetime achievement award in this year's Guild Of Health Writers' awards. The resident GP on ITV's This Morning, Chris is one of the UK's best-loved media docs and also a former patron of the MHF. He caused a storm in 2007 when he drew attention to the censorship by You Tube of a video he'd posted on the site showing men how to examine their own testicles. 'YouTube is stopping us from saving lives,' he said. You can still see the videos on our malehealth website. Chris's excellent cancer basics article has also long been a popular page on malehealth. Paul Dinsdale, Chair of the Guild, said: 'The Guild committee made the Lifetime Achievement award to Chris for his exceptional work over many years in the field of preventive health, including the pioneering of smoking cessation techniques for patients who want to quit, campaigns on preventing breast, bowel and testicular cancer and his ability to communicate quite complex health messages to the general public. He has managed to educate many people of all social groups about health and medical issues, while doing it in a very entertaining way, and the award is richly deserved. Well done, Chris, pictured below receiving the award from Guild president Dr Mike Dixon and Jessica Mann from award sponsors Shire Pharmaceuticals.